Son, on the other hand, is a gamer. If he’s not working or watching/playing basketball he’s playing, reading about, or watching clips about video games. WoW, Halo, NBA 2K9… the man sure does love his video games. So when we found out that we could get passes for E3 (Electronic Entertainment Expo) this year… Son was incredibly excited. Me… not so much. I was worried that I wouldn’t enjoy walking around looking at a bunch of video games I’ll probably never play, and I feared I’d feel incredibly out of place there. Of course, my worries were completely silly. I had a blast. Although many of the games meant very little to me (like I said, not a gamer), there were some I recognized – God of War 2, Assassin’s Creed 2, some of the Wii games, and the demo of DJ Hero (like Guitar Hero, but for DJs) seemed pretty cool. Of course, if you want a real review of how E3 was and what was there, you’re going to have to look elsewhere. Most of the time I didn’t really know what I was looking at and didn’t play a single demo, though I did enjoy watching Son and his friend Dave play some of the games. So this roll, the Katana Roll. Seaweed salad, imitation crab, and mayonnaise, rolled up with sumeshi in a rice paper spring roll wrapper then topped with fried onions. 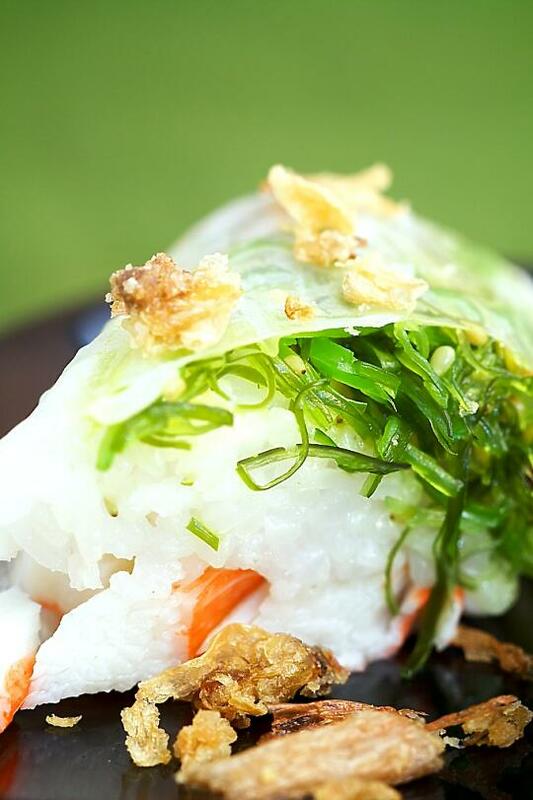 It’s a playful roll, slightly sweet from the imitation crab, crunchy from the seaweed salad, salty from the fried onions on top. Light, summery, delicious. Note: I do not have a recipe for seaweed salad, though I’m definitely looking. I buy my seaweed salad from my local Japanese market – most Japanese and many Asian markets will carry some variation of it. When I do find a good recipe for seaweed salad, I will post it here for you without hesitation, promise! Lay two sticks of imitation crab and about a tsp of mayonnaise in the middle of the wrapper, leaving about 2 inches uncovered on either end. Top the rice with about 1/6 cup of seaweed salad. I recently ordered some fresh sushi-grade tuna from them and it was amazing. I don’t work for them or anything but they truly provide an amazing service. Love your website! Was trying to find out the recipe for seaweed salad too. Kindly email me when you find a decent one. In the mean time I will stick my eyes on this super good-looking website! Thanks for the Katana Roll recipe! I’m having some friends over Wednesday and was looking for something like this. I’m definitely bookmarking this website. Thanks for the Katana Roll recipe ! Love your website! Was trying to find out the recipe for seaweed salad too. Looks good! Thanks for the recipe. I may try to make sushi for the first time. Very tasty and healthy food. May I know what’s the history of this food? mmmm this looks good, I wanna make this myself. But, I think the ingredients from the recipe you posted are very hard to find and the others are expensive. I tried making sushi once, it is a lot harder than it looks, especially when you’re rolling it. I love sushi and I love to cook but this is the one thing I will leave it to the expert. Hi, I thought your post was great. I intended to compose you this little remark to finally give many thanks over again for your personal marvelous knowledge you’ve documented in this case.